Mysterious sorcerers enslave the unwary using dark forces. Rotting corpses rise from their graves and hunt down the living, ravenous for warm flesh. The survivors run in terror, or huddle together for safety, slowly counting the days until the slavering mob breaks down the barriers. Why do zombies fascinate us? What cultural forces shape the way we see and understand these creatures? Why do they want brains so much? Like infestation-apocalypse survivors looking for ammo, we'll seek these answers with vigor and determination. 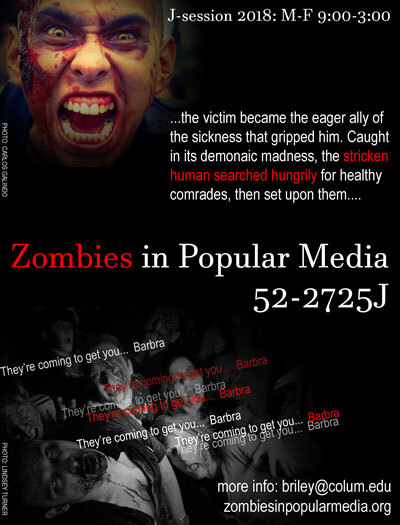 This site provides information about the Columbia College Chicago literature course, Zombies in Popular Media, created and taught by Brendan Riley. Look around, have a taste.